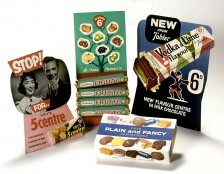 Much of The Robert Opie Collection is currently housed at Opie's Museum of Memories at Museum of Brands, Packaging & Advertising in London. Built up since 1963, The Collection now contains over 500,000 items which together tell the extraordinary story of Britain's consumer society, its lifestyle and culture - dramatic changes that have happened as a result of and since the Industrial Revolution. Initially, as a teenager, Robert Opie gathered together contemporary packaging, everything from cereal boxes to cigarette packs. The first item in the Collection was a Munchies pack bought by Robert on Inverness railway station in 1963, when he was 16. A few years later Robert's mission extended to understanding the origins and development of brands and retailing ; he assembled the evidence from thousands of surviving examples of bottles, tins, labels, signs and many forms of promotional and advertising material. By 1975 there was enough material for Robert to be invited to stage a one-man show at the Victoria & Albert Museum in London. This was entitled The Pack Age ; A Century of Wrapping It Up. This temporary show was such a success with the public and the media that it encouraged Robert to try to create a permanent Museum, and this was achieved in 1984, with the setting up of the Museum in Gloucester. The Collection expanded rapidly when Robert decided to extend it into further areas of social history - toys and games, travel and transport, leisure and entertainment, comics, magazines and newspapers - every facet of daily life, including souvenirs from exhibitions and major events such as coronations. Ephemera such as postcards, song sheets, posters and brochures show not only the story of design and fashion but also the whole structure and transitional nature of everyday life. The research Robert undertook was similar to assembling a vast jigsaw where each tiny piece contributes to the undersatnding of the wider picture. " Some may consider so much apparent trivia to be so much rubbish," says Opie, "but it is amongst the fragments of daily living that we are psychologically and socially rooted, and this is where the impulses of our society can be found." Many people now recognise that such a wealth of historical reference provides intellectual stimulation, has social significance, gives aesthetic pleasure, is an education to the young, provides the evidence from which the student may learn of the past, and is an excursion into nostalgia. Robert Opie concludes :"It is difficult to understand why recognition for this part of our national heritage cannot at the moment obtain the status it deserves. It remains the poor relative alongside the established works that fill our national galleries and museums. Our mission is still to change this perception."